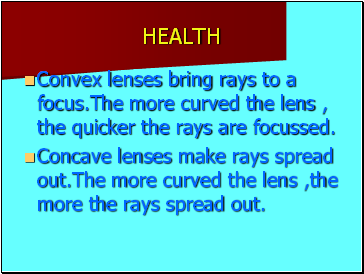 Convex lenses bring rays to a focus.The more curved the lens , the quicker the rays are focussed. Concave lenses make rays spread out.The more curved the lens ,the more the rays spread out. 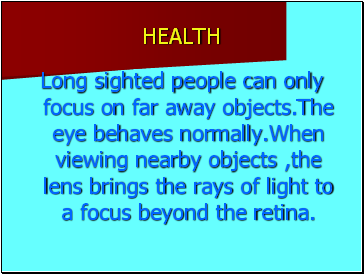 Long sighted people can only focus on far away objects.The eye behaves normally.When viewing nearby objects ,the lens brings the rays of light to a focus beyond the retina. 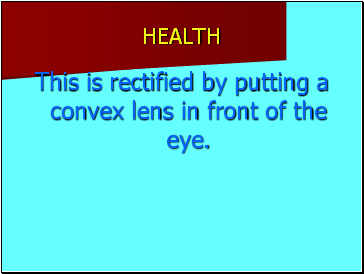 This is rectified by putting a convex lens in front of the eye. 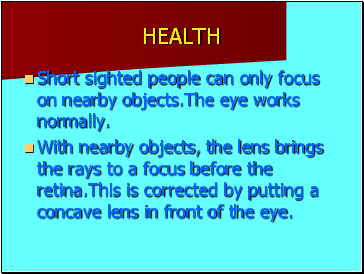 Short sighted people can only focus on nearby objects.The eye works normally. With nearby objects, the lens brings the rays to a focus before the retina.This is corrected by putting a concave lens in front of the eye. The focal length of a lens is the length from the middle of the lens where the rays come to a focus. Fibre optical cables are cold light sources because no heat energy is produced in them. 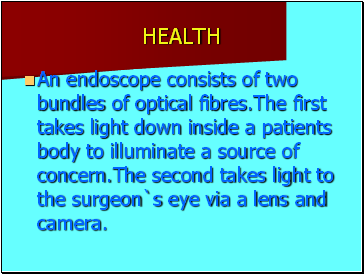 An endoscope consists of two bundles of optical fibres.The first takes light down inside a patients body to illuminate a source of concern.The second takes light to the surgeon`s eye via a lens and camera.